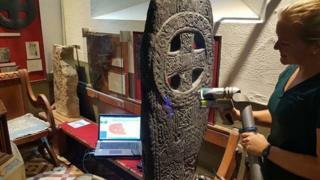 More than 200 Manx medieval stone crosses are being scanned to create an archive which will help with their future preservation. Manx National Heritage (MNH) said the work was needed as the 210 crosses, carved between about 500AD and 1300AD, were "incredibly important objects". A spokeswoman said the scans would provide evidence of current condition and could also be used for future education and research. They will be available online by 2019. The crosses and carved stones, which are situated across the island, range from simple grave-markers to intricately inscribed monuments. Some were carved with letters of the Ogham, Latin and Runic alphabets, while others include personal and place names and scenes from Christian and Norse mythology. The MNH spokeswoman said the laser scanning technology being used would capture the crosses to a "resolution of one tenth of a millimetre".